Grand Pacific MarBrisa Resort and Hilton Grand Vacations (HGV) have announced the expansion of their relationship. Building upon the strength of an affiliation agreement that began in 2007, Hilton Grand Vacations will now assume responsibility for Grand Pacific MarBrisa timeshare sales and marketing, as well as many resort management services. According to David Brown and Tim Stripe, co-presidents of Grand Pacific Resorts, the new structure combines Grand Pacific’s long tenure as the leader in the Southern California timeshare marketplace with the global strength and hospitality expertise of the Hilton Worldwide timeshare brand. "The enhanced synergy between the two organizations begins with the renaming of our spectacular Grand Pacific MarBrisa Resort as Hilton Grand Vacations Club at MarBrisa," Stripe said. According to Mark Wang, President of Hilton Grand Vacations, “The time is right to take our affiliation with Grand Pacific Resorts to the next level. Our expertise in sales, marketing and resort operations is an ideal complement to this magnificent Grand Pacific development." 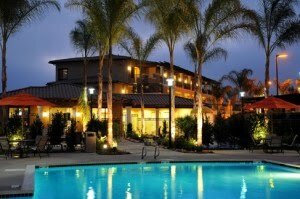 Built in 2008 and situated on 41 prime acres overlooking the Pacific Ocean, Hilton Grand Vacations Club at MarBrisa is located near the quaint coastal village of Carlsbad and offers year-round appeal as an idyllic vacation destination. The classic Spanish Mediterranean-style resort features luxurious studio, one-, two- and three-bedroom vacation villas, each with a private patio or balcony offering panoramic ocean or park views. Hilton Grand Vacations Club at MarBrisa offers guests direct access to nearby LEGOLAND® California, SeaWorld, and the world-famous San Diego Zoo. Golfers will delight in dozens of excellent nearby courses, including The Crossings at Carlsbad Championship Golf Course adjacent to the resort.